I spent some time fooling around with polymer clay awhile ago. One of my favorite things to do was to see if I could mimic the look of some of the fabric and paper projects that I've done over the years. 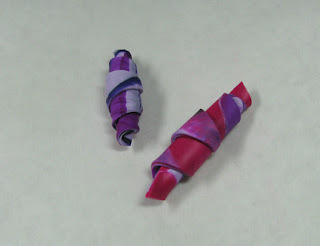 It turns out that polymer clay is a wonderful material to use to make beads, something that many of you already know! For those who haven't messed around with it much, here's a really easy project to get you going. All you really need is a couple of colors of clay (I bought Sculpey III), something to use to roll it out, something to cut it, and something to suspend the beads as you bake them. You could buy an acrylic roller and a polyblade, or you could just use whatever you've got around the house (like an exacto knife) until you decide if you really want to invest in good tools. None of them are expensive (except for a pasta machine), but I'm a believe in deciding before buying! 1. Condition the clay. Don't let the fact that Sculpey III is soft fool you. You need to knead it for awhile until it softens up even more and becomes elastic. You'll feel the difference. Mix some colors together, stretching and pulling and folding until you like the look of the mix. 2. Roll an even slab. You can use a couple of skewers, playing cards, or whatever to keep your roller level. When you decide that polymer clay is your life, get a pasta machine. 3. Cut a triangle from the slab with the polyblade or exacto knife. 4. Roll the triangle around a wire to bake, starting from the wide end. Make sure the tip is secured against the rest of the bead. 5. Make additional beads from triangles. You can texture some or all of the triangles before rolling if you'd like. 6. 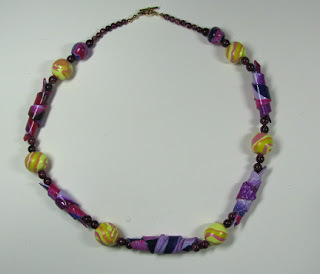 Make variegated round beads in the same or contrasting colors. 7. 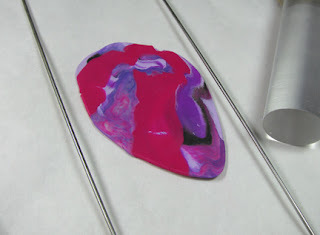 Suspend beads on a wire over a pie pan and bake according to the brand's instructions. 8. Finish the surface of the beads. I like to wet sand them and add a coat of Future floor polish. 9. 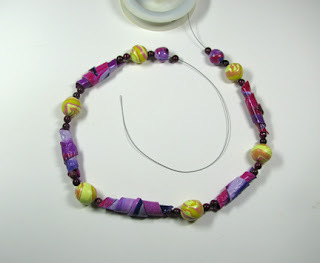 String beads on beading wire, using smaller spacer beads in between the polymer clay beads. 10. 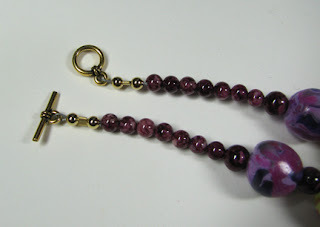 Finish the ends using spacer beads, crimps, and a toggle clasp. What a nice result and interesting result! I am....! But sometime I also have to study my google reader, when in need of a break!